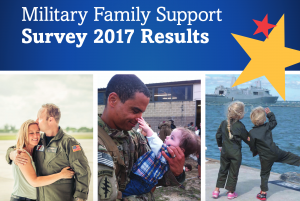 Today, March 1, 2018, the Military Family Advisory Network (MFAN) released the results of the 2017 Military Family Support Programming Survey results. This survey covered myriad topics in the military community with an important look at the financial readiness of the military community. Top findings report that military life creates financial stress, and this stress has widespread implications. Respondents report finances to be just 6% of support needs, however, a deeper analysis of the financial questions reveals that financial challenges exist. The majority (60%) of respondents don’t have enough in their savings to cover 3 months of living expenses. Some respondents (15%) have faced food insecurity and most military families are carrying some form of debt. In addition, an overwhelming 80% of respondents report that Permanent Change of Station (PCS) moves cause great financial stress. Every move means a household reset. One respondent said, “It tightens things even more. Each house needs new things, new vehicle registration, different climates require different types of equipment”. Participants who are experiencing or who have experienced financial strain said that it affects them emotionally and physically. It interferes with their relationships, quality of life, and work life. While these things are difficult to read, there are some good things going on as well. Military families may find themselves in some tough financial situations, but they know where to turn for help and they are looking to support systems in their communities. A large proportion of respondents’ support systems come from their personal networks of families and friends and their faith-based communities. This result shows that participants’ communities are increasingly important part of their satisfaction in military life.